E.ON UK describes itself as "one of the UK’s leading integrated power and gas companies – generating and distributing electricity, and retailing power and gas – and are part of the E.ON group, the world's largest investor-owned power and gas company." It generates approximately 10% of the United Kingdom's electricity. The World Coal Institute lists E.ON UK as having 4.9 gigawatts of coal-fired power generation assets in 2005..
On its website, E.ON UK states that a part of its corporate social responsibility program includes "Working towards low carbon energy" with the company stating that it will "produce and deliver energy to our customers, whilst reducing our carbon intensity." It also states on its website that "we recognise the environmental impact of our business. We know that Climate Change is an important issue for society." On its website E.ON UK states that in 2006 carbon dioxide emissions from its generation plants totaled 27.6 million tonnes. Ironbridge Power Station is located in Telford, Shropshire. It comprises two units and has an installed capacity of 970 megawatts. As a result of the European Union Large Combustion Plant Directive this power station will be closed. Kingsnorth Power Station is located in Rochester, Kent. It comprises four units and has an installed capacity of 1,974 megawatts. As a result of the European Union Large Combustion Plant Directive the four existing units of this power station will be closed. However, in October 2006 E.ON UK announced plans to build two new units at the same site with the aim that they would be commissioned and then the four original station units demolished. A wide range of climate change groups opposed the proposed new coal-fired units. In October 2010, E.ON said that economic conditions were not right for the company to continue pursuing the project. E.ON's decision left just one contender in the competition: Longannet entered by a consortium led by Iberdrola-owned Scottish Power. The government insisted the project will go ahead in spite of the withdrawal of E.ON, although £1bn announced by Chancellor George Osborne is expected to pay for just one demonstrator plant rather than the four industry had hoped for. The validation project is likely to cost £500m to build and £500m to operate, said Professor Stuart Haszeldine, FRSE, Professor of Carbon Capture and Storage and Geology at the University of Edinburgh. Ratcliffe Power Station is located in Ratcliife on Soar, Nottingham. It comprises four units and has an installed capacity of 2,000 megawatts. This power station is fitted with a Flue Gas Desulphurisation unit to reduce sulphur dioxide emissions. 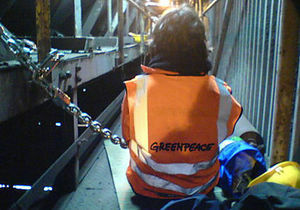 A Greenpeace activist chains herself to the coal conveyor belt at the Kingsnorth Power Plant near Kent, England. 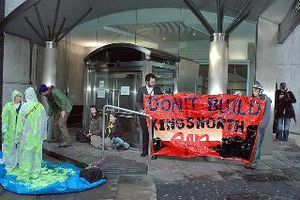 On October 8, 2007, 50 Greenpeace UK activists occupied the Kingsnorth Power Station near Kent, England. One team of people shut down the conveyor belts carrying coal into the plant, and then chained themselves to the machinery. Another team scaled the plant's chimney, upon which they painted the phrase "Gordon Bit It." Greenpeace held the action in protests of plans by the plant's owners, E.ON, to build two new coal-fired plants at the site - which would be the first coal-fired power plants built in the UK in 20 years. Police arrested 18 people during the action. In February PR Week reported that "E.ON is calling in PR support as it gears up for a David versus Goliath battle with environmental campaigners over a controversial new power station." PR Week's Clare O'Connor noted that the brief would include crisis communications. The electricity utility's quest for PR support followed documents obtained by Greenpeace UK revealed company's determination to get the government's approval for a new coal-fired power station. The documents, which were obtained under the Freedom of Information Act, Greenpeace reported, included one in which E.ON insisted that John Hutton "has no right to withhold approval" of the proposed new coal plant. "E.on also tells the government not to include carbon capture and storage in their conditions for building the new coal plant. It took the government just six minutes to reply: 'Thanks. I won’t include.” Just like that ... In the same email, E.on admits that carbon capture doesn’t exist (or, in their words, it 'has no current reference for viability at any scale'), exposing the government’s energy policy and E.on's media strategy – based on a faith in the potential of carbon capture technology to deliver 'clean coal' – as hollow." The following month, PR Week reported that E.ON had hired the PR firm Edelman "as the energy giant looks to develop its nuclear portfolio and counter opposition from green campaigners." E.ON UK's head of PR, Jonathan Smith, told PR Week that "Edelman will offer us support lobbying the Government and political audiences ... It will also carry out an information programme, getting the message across about the urgency to replace generation capacity. We also have plans for new nuclear stations. Edelman will be involved in work for the upcoming white papers." The World Development Movement's media officer, Kate Blagojevic, commented on Edelman's role that "it's clear that E.ON have called in the big guns and are preparing themselves for a PR battle to win the hearts and minds of the British public. So brace yourselves, in the coming months, you can expect to be inundated with headlines extolling the virtues of: 'Carbon Capture and Storage', 'Clean Coal', 'Energy efficient E.ON'. Claims which are unproven, implausable and in some cases, impossible." In April 2008, PR Week reported that E.ON had "consolidated its consumer and trade PR activity into one agency with the appointment of The Red Consultancy". PR Week reported that "The Red Consultancy had previously held the consumer PR account, while Target PR handled the brand's B2B activity and Leeds-based Mortimer Chadwick Grey handled part of its consumer work. The Red Consultancy will now handle all aspects of the brand's PR activity." The PR firm's account team will include Ed Staples and Paul Davies "and report into E.ON retail PR manager Nick Sandham." ↑ E.ON UK, "Welcome to E.ON UK", E.ON UK website, accessed June 2008. ↑ CoalPro, "UK", World Coal Institute website, accessed June 2008. ↑ E.ON UK, "Corporate Responsibility", E.ON UK website, accessed July 2008. ↑ E.ON UK, "Environment", E.ON UK website, accessed July 2008. ↑ E.ON UK, "What we are doing in our Generation activities", E.ON UK website, accessed July 2008. ↑ Sylvia Pfeifer and Fiona Harvey, "Competition for carbon capture project to go ahead" Financial Times, October 20, 2010. ↑ Protestors Raid Coal Power Plant, BBC News, October 8, 2007. ↑ Greenpeace Shuts Down Coal Fired Power Station, Greenpeace UK website, October 8, 2007. ↑ "E.ON seeks help for green battle", PR Week, February 14, 2008. ↑ 17.0 17.1 bex, "Coal giant dictates government climate policy", Greenpeace UK, January 31, 2008. ↑ Clare O'Connor, "E.ON turns to Edelman as nuclear debate rages", PR Week, March 13, 2008. ↑ Kate Blagojevic, "Climate campaigners vs Edelman: a PR battle of David and Goliath proportions", Blogging Kingsnorth, February 14, 2008. ↑ Gemma O'Reilly, "E.ON retains The Red Consultancy for PR support", PR Week (UK), April 2, 2008. ↑ E.ON UK Board, organizational web page, accessed July 10, 2012. ↑ E.ON UK Customer Council, organizational web page, accessed July 10, 2012. This page was last edited on 22 May 2013, at 18:24.